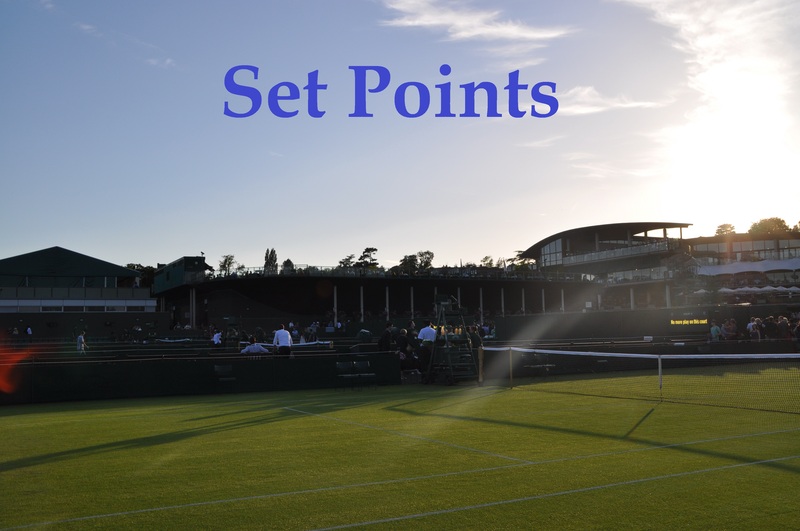 This will be a snappy Set Points just to wrap up today’s results – I was busy at work so couldn’t really follow the scores and then played tennis this evening so missed the first night match. Unlike Tuesday, tonight’s tennis from myself wasn’t so good! The conditions were tricky as it was damp and the ball wasn’t bouncing so much! I played three doubles matches and was on the winning side once. In Stuttgart, three of the four seeds in action tumbled out of the tournament. The highest seeded casualty so far was the number one seed, Angelique Kerber who lost her first match at this tournament since 2014, falling in straight sets to Kristina Mladenovic. The Frenchwoman won, 6-2 7-5 to record another impressive win, her third top ten win of the year. Kerber spoke in press about having an off day – things still haven’t clicked for Angie this year and I doubt it will get much better during the clay court season where she has been unable to find her best form on outdoor red clay in recent years. Anastasija Sevastova levelled up her head-to-head with Johanna Konta thanks to a 6-3 7-5 victory over the number six seed. Not a massive surprise as this was on clay where Sevastova is much more comfortable. In the first match of the day, the Stuttgart GOAT, Laura Siegemund had another superb win over the number eight seed, Svetlana Kuznetsova, 6-4 6-3. The only seed to survive the day was Karolina Pliskova who edged a tight two setter with CoCo Vandeweghe, 7-6(2) 6-4. I couldn’t find a stream on bet365 which was frustrating but I did catch bits on another site. The first serve went entirely with serve as Pliskova simply played a better tiebreak. In the second set and in a flurry of breaks, Pliskova was properly clutch to hold onto her serve at *4-3, saving three break points. The other two results of the day were both decided in straight sets as Carla Suárez Navarro defeated Elena Vesnina, 6-2 6-4 and Maria Sharapova continued her impressive comeback with a 7-5 6-1 victory over Ekaterina Makarova. Sharapova’s serving stats were excellent once again, dropping just five points behind her first serve. In a serve-dominated opener, Makarova had an open court on the first break point of the match but missed. From there on, Sharapova dropped just one more game. Sharapova’s press conference is linked below – the British journalists are hilarious, asking all the controversial questions. It does make me laugh since they rarely cover women’s tennis with much interest. The top headline on BBC Sport earlier was about Eugenie Bouchard’s comments on Sharapova that surfaced yesterday. Of course I realise that stories like this get clicks but I do find it very disappointing that it requires some kind of controversy and nothing to do with the actual tennis for women’s tennis to get some attention in the UK. Friday is quarter-finals day in Stuttgart and an advance warning that it’s going to be another tricky one for me to follow – i’m heading back home for the Bank Holiday. I’m feeling a little disillusioned with the tennis this week as Stuttgart is one of my favourite tournaments but being busy at work and then not being able to catch-up properly is not working in harmony! April 27, 2017 in Set Points, Stuttgart, WTA. Hey! Thank you for your article. Nice for me to discover that I was paranoid about you “hating” Simona by the way, sorry. For match viewing I found an app called sport zone. You can get it as an extension in chrome and download it like this. It’s pure gold! None of us ever hated Simona. There was a period a couple years ago where her diehard fans were pushing her as the second coming of Christ and it rubbed a lot of us up the wrong way. I watched Siegemund & Kuznetsova- possibly the longest 64 63 match ever played! Sveta was flat as a pancake for most of the match. Couldn’t get consistent depth on her ground strokes, wasn’t sharp with her footwork and generally just seemed way too subdued. She didn’t even hit a winner until 15minsinto the match! So while Laura’s stats look impressive on paper, I think had Kuznetsova gotten her balls deeper into the court, the German wouldn’t have hit as many winners or drop shots. James, gotta agree with you on my local perspective here in Malaysia on ‘they rarely cover women’s tennis with much perspective’. I guess its the same phenomenon everywhere. Even in the English daily here, there’ll usually be a page in the sports section dedicated for tennis and the biggest column is always for ATP stuff 😦 Only news related to players like Serena, Maria, Vika, Petra, Ana etc will make the biggest column, but that is also once in a while. Also, news like an ATP player winning a 250/500 (eg Tomic winning Bogota) will most likely make the biggest column more than a WTA player winning an International/Premier 700 (eg Schiavone winning Bogota) but its Schiavone who is the Slam champion. But we cant really blame them cause mens’ tennis appeals more to the locals here, so yeah. Would love to see women’s tennis get more coverage and eventually, equal coverage, as ATP in the long run here. Very nice stadium in Istanbul much better that Stuttgart. does anyone know the name of the song that’s played during warm ups for all the matches?